"Han Mitakuyape. My Lakota name is Waunsila Win. It means compassionate woman. My English name is Brenda White Bull. "I’m a US Marine Corps veteran of 20 years. I served 1989 to 2009. 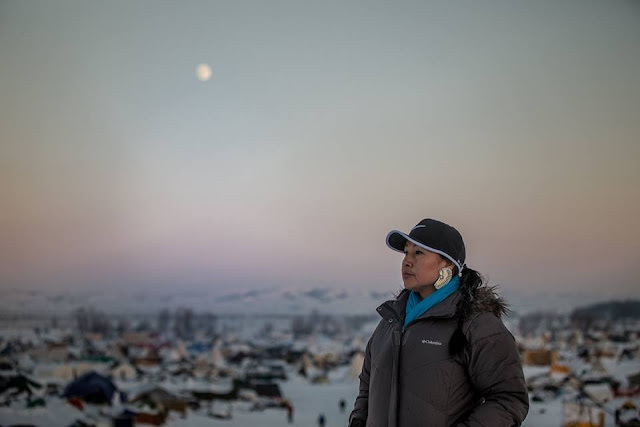 I’m a water protector for life." I come from Kenel, South Dakota. My parents are the late Albert and Maxine White Bull I'm the great great granddaughter of Sitting Bull. I am very proud and honored to be a descendant of Sitting Bull, and to carry out his legacy. And we are all Sitting Bull’s people here, and I always tell everyone who comes here that, tell people that you are from Standing Rock, because you deserve it, this is your home, this is not just our home anymore, it opens up, and that hopefully will bring them back home. And I encourage everyone to come home again and visit. 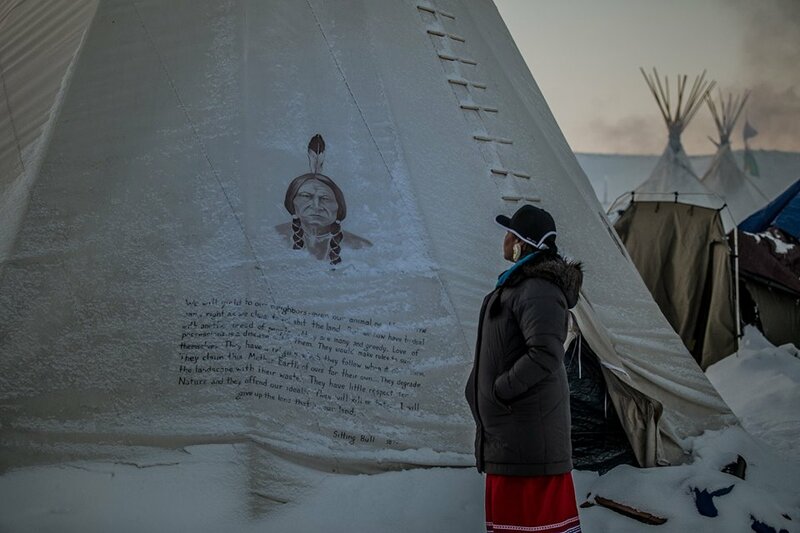 Photo via Ayşe Gürsöz | Indigenous Rising Media — at Oceti Sakowin Camp. We talk about the seven generations. I believe that we are their dreams come true, so for these next seven generations that come along, I will never know my great-great-grand children, but I want to know that they will have the same fight in them as we do today. Our ancestors that fought before us never gave up, never once, because they had us in mind. They never met me before, but in a spiritual world they are here with us today and they’ve always been here with us to protect us and give us guidance and spiritual leadership." "Sitting Bull was a man who took care of his people. He cared about their safety and their life and all the children and the elderly. And he always provided for them first. Before he would give to himself, he gave to them. He always thought of them first and I think that’s leadership by example. You don’t have to have a title to be called a leader, you know we’ve got lots of young children that ran to DC… a lot of the children and the elderly have given us guidance. And I think that’s him coming through us. Because we can’t think of ourselves. This isn’t a movement about ourselves, this is a movement about human kind, about nature. So when you are looking at me, you are looking at him. And you are looking at so much goodness, so much positivity that’s being surrounded here, and when people come here, I express to them that I want you to go home with good feelings. I tell them, tell those stories, so that they can come back. Bring your families back, and if you don’t feel good about leaving right away, stay for a while. Pray. Everyone I know who’s come here will leave as a changed person, for the good of all mankind and it spreads and it trickles out. And that’s the beauty of all this going on that I see and I can say about Sitting Bull, and that’s what he wanted for his people, to be happy, and to be safe, and that’s what we are here to do, is to protect the people." 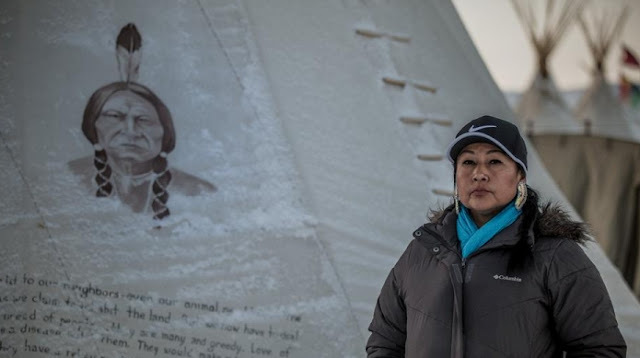 Responses to "Meet Sitting Bull's Great Great Granddaughter Brenda White Bull at Standing Rock"
Waunsila Win, yes, your Great Great Grandfather is with you always. 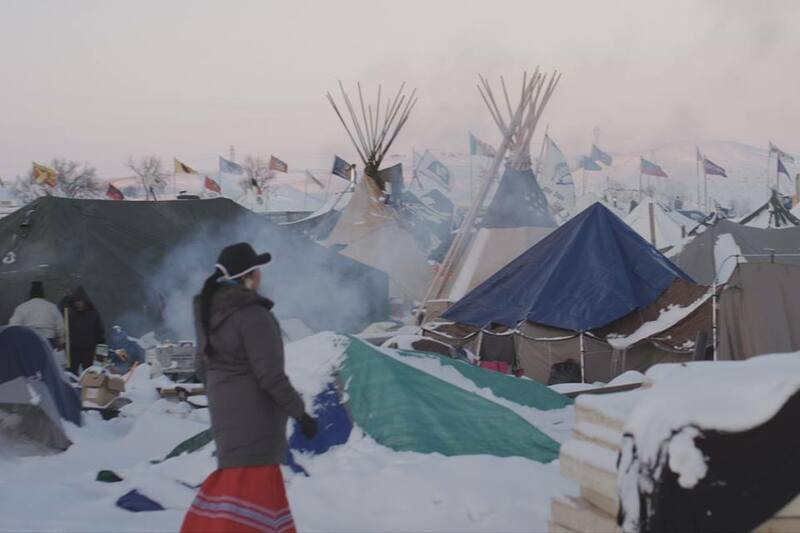 He is standing with all of our relatives at Standing Rock, and he is standing proud. Prayers, love & peace to every soul at Standing Rock today. Thank you for this wonderful article. Stand tall. I feel honored to meet you through this cortical. You have a proud heritage, and you are serving it well....to preserve and see it live on. Blessings! there for all people. 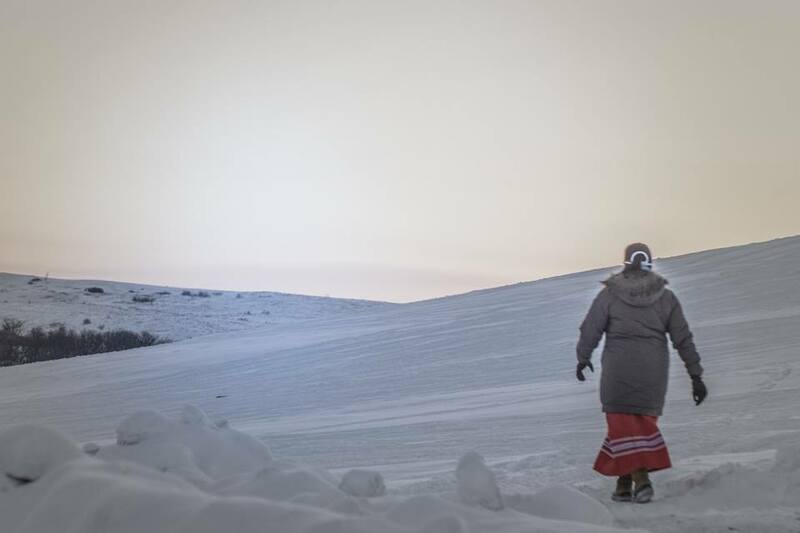 I pray for the respect that sacred land deserves. Water is life! My name is Pam Bull. Maybe a relative?? Waunsila Win thank you and all nations for protecting our water and being peaceful against the brutality of the U.S. Government and small oil. I have been learning so much about the wisdom of the Native Americans. Your people have more spirit than the rich by far. Wansila Win. You honor your Ancestors with your Courage and strength. You honor Our Mother Earth with respect. I am with you in Thought everyday, and I send you Love and Respect. Maybe the time has come that was foretold about. When The Warriors of The Rainbow will Stand Together, as one. Stand Strong. Stand proud. America is going through some strange and difficult times! Ahead is the future and any positive change is good. Peace. I enjoyed meeting you by way of this article. I so wanted to be there with you all but could not, I did however keep close track of what was going on and felt very proud of how everyone stood their ground even when the government behaved badly and some were mistreated on our side. I pray for all in the coming year. Thank you. Thank you for this history that some may not know, while you all are making history for your great-great-grandchildren to see some day Ms White Bull. You all are surrounded by millions of us, by our hearts, prayers, and spirits my Native brothers and sisters. We will continue to do all we can from where we are, all over the world. Much love and deep respect. "Pigs were not in the so-called "New World," later called the Americas; until they were brought here by the people from Europe. The majority of Native Americans in the USA, never ate pork until, it was fed to them while they were confined in the Reservation/Concentration camps. 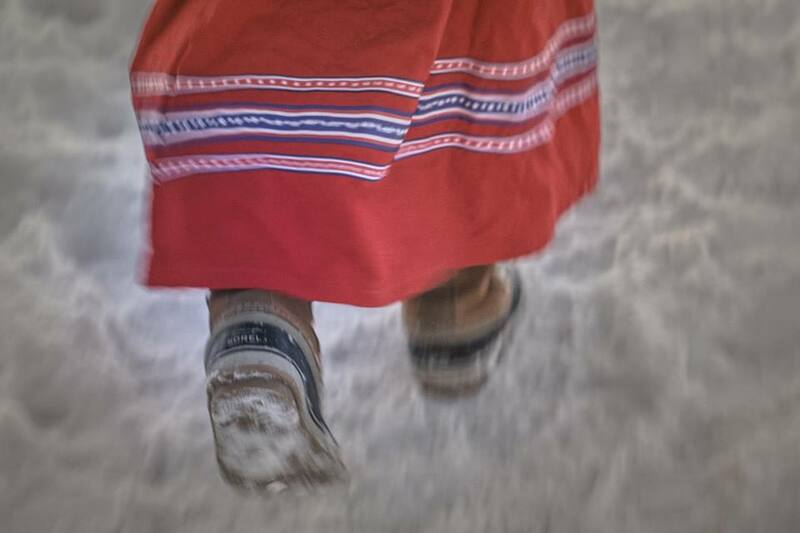 Their movement was restricted and they were prevented from hunting and fishing for the food that their ancestors used to eat." Ipray that some very good things come out of this long stand... you are very strong to go through this against such adversary conditions and abuse! You can not only serve your interest and that of all Native Americans, but also serve as a strong role model of non violence and standing for what is true and right! This country so badly needs better leadership and role models than we are seeing! I am part Cherokee Indian on my mothers side I learned about the different tribes in college (late in life) graduating in 2003 with a BA in Comparative Religions. Its a crash course really in 5,000 years of history of the world.. religion being peoples whole world in the past! I related more to the Native American spirituality, along with some other more spiritually driven practices in the world than the typical mainstream Christianity. I have gotten so much out of learning about all of the different religions and there is a thread of spirituality in each, while also having a different thread of more religious dogma and restriction, based on convenient judgement to 'separate'. It has been my hope ever since this awareness, that we all come together in solidarity against the oppressors and the elite who really are not part of the American ideal, but more the British and other European perspective we tried to get away from because of religious oppression and abuse. The ideal of democracy (which your Eastern tribes helped create in the fashion of their own constitution... is a far cry from what some leaders want for this country and its people. We need to remedy this! We can help each other if working as one! And in learning the positive and spiritual things we each hold dear and sacred! We all want safety, security and happiness with the freedom to reach our highest potential and for that of our children and grandchildren. And with those natural remedies that are compatible with our bodies, minds and systems of this world. I am foremost a Truth Seeker and am searching always for what is truth and a higher vibration. Because of that, i am open to looking and listening to all the practices throughout history.. and that is a rich source to consider all of it and see what is the spiritual essence in each idea. Its all one Spirit, and that has no nationality or separation from another. Thank you for all of your gifts.. now the whole world can share this gift! I can't tell how gratifying it is to see this rise in participation, and involvement in this movement. This is a positive development for this nation. Good for you folks.